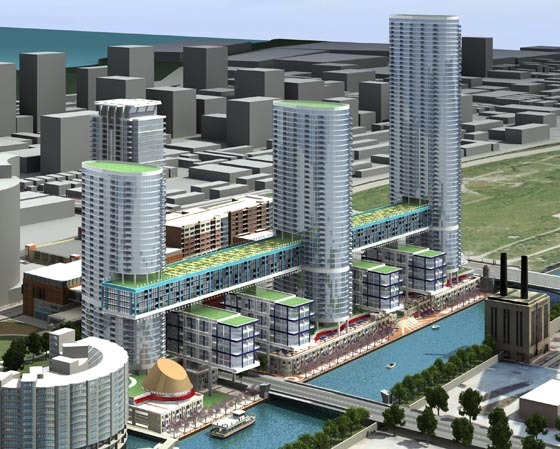 A dense mixed use development along the Chicago River and south of downtown is planned as a mix of residential; and retail uses. Housing types would include high rise rental and condominiums, mid rise lofts and riverwalk hugging townhomes. A mix of river and street level retail would include shops and restaurant. The podium level matches the adjacent Roosevelt road level and allows three levels of parking to be located below it. Flanked by café restaurants, the central portion of the riverwalk would have a monumental stair and seating area that would be the access point for the water taxi and tour boats that use the Chicago River during sprig summer and fall.